Save time and money with flooring that’s resistant to impacts, chemicals, and abrasions! Minimizing Company Downtime: With complete installations in just one day, you can get back to full operation quickly—saving you time and money. Creating a Safer Environment: We offer a variety of custom options to enhance the value of your Atlanta industrial flooring, including non-skid surface textures. Offering Extreme Durability: Resistant to impacts, chemicals, and abrasions, our floor coatings create a smooth, even surface that holds up to heavy wear and tear. Protecting your employees and your bottom line are top priorities in the industrial field, and Tight Line Concrete Coatings can help you enhance the functionality of your space quickly and efficiently. 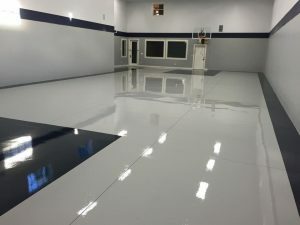 To learn more about the garage floor coatings and custom concrete coatings we offer throughout Atlanta, Alpharetta, and the surrounding area, just give us a call. You can also get started with a free, no-obligation estimate now by submitting our simple online form!